Or so we tell people. That’s Fort Denison, in the early days of the colony a punishment island nicknamed “Pinchgut” and then in the 1850s the fort was built to defend Sydney Harbour against a Russian invasion. Something to do with the Crimean War, I think. But today Fort Denison really is under siege: Fort Denison to be protected against rising sea. 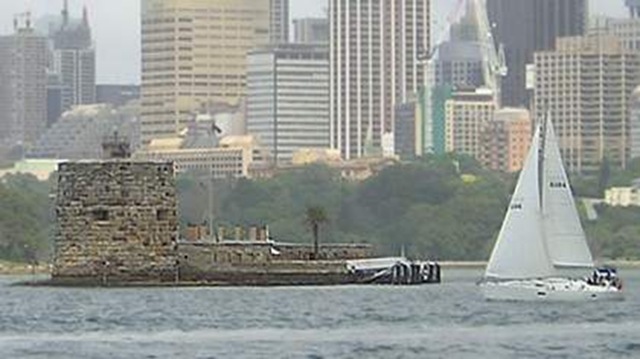 The historic Fort Denison in Sydney Harbour will be restored to improve the structural base of the fort, which is is being eroded as a result of changing sea levels. The New South Wales Government is investing $1.5 million to replace the sandstone blocks around the base of the fort. Restoration work will begin next week and will take up to 12 months to complete. New South Wales Minister for Environment Phil Koperberg says the restoration work will ensure future generations can visit the heritage-listed site. “It is structurally sound but unless some work is done now, then ultimately given the weight of the fortification, which is over 150 years old, then ultimately these lower block of sandstone will give way as a result of constant erosion,” he said. “This work is designed to prevent that from happening.